Having just wrapped up our full review of the Samsung Galaxy Fame, we’re ready to share with you the results of our extensive battery performance test. The Fame is the latest budget-range offering from Samsung, featuring a specs sheet that is far from impressive, but an Android Jelly Bean build that should hopefully result in increased performance from the 1300 mAh battery compared to last years’ Gingerbread devices. Let’s take a look. 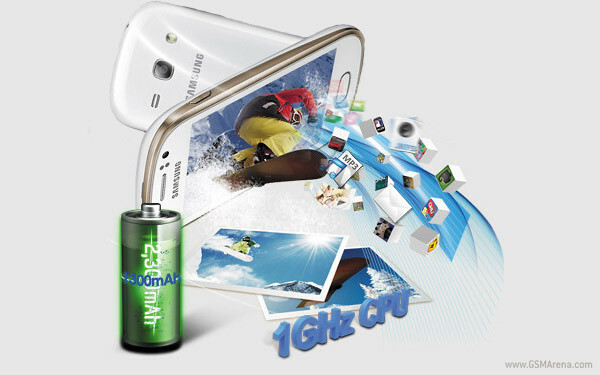 Unlike its similarly-spec’d sibling released athe same time – the Samsung Galaxy Young – the Galaxy Fame features a 1GHz Broadcom processor rather than a Snapdragon-based CPU, which Samsung uses in some of its more budget-oriented offerings, like the Samsung Galaxy S II Plus. 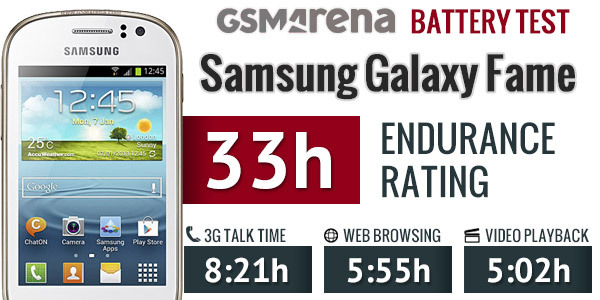 In our first test, the talk time of the Galaxy Fame is a decent 8 hours and 21 minutes, which lands it at about the middle of the pack, a step above single-core budget offerings like the Samsung Galaxy Ace Duos and Galaxy Pocket. When it comes to web browsing, the Fame once again beats out its budget-range competition, and comes in at just under 6 hours. Finally, video playback was one area where the Galaxy Fame disappointed. Coming in at just over 5 hours, the Fame comes in near the bottom of the pack, but we doubt you’ll have much fun watching video clips on the 3.5-inch screens poor viewing angles and HVGA resolution. Standby performance of the 1300 mAh battery on the Fame was slightly under what we’d expect from a Jelly Bean device, and resulted in an overall endurance rating of 33 hours. This means you’ll need to charge your phone every 33 hours if you use your phone for 1 hour of video playback, web browsing and 3G talk each day.